NEW OLD STOCK ©2016 All rights reserved. Founded by Jeremy Kaplan and Jason Halter, New Old Stock is a story about design meeting construction using ISO shipping containers. It shows how we can reuse, re-purpose, up-cycle & make rare the everyday object. The design mandate is about future proofing & building small & efficient space, micro architectures, get-away cottages, or urban cloisters. Micro-sized footprints are created using one-to-two ISO shipping containers. The options of what you can do are virtually endless, and the end result leaves you with architecturally intriguing spaces that are both sophisticated in design and function, yet compact and relocatable. Using cutting edge design and engineering, New Old Stock offers resilient, sustainably manufactured modified 20’ single-use high-cube shipping container units. Superior craftsmanship & quality materials are combined to enhance function & efficiency of each variation of New Old Stock’s micro units. Our design mandate is about future proofing & building small & efficient spaces, micro architectures, get-away cottages, or urban cloisters. 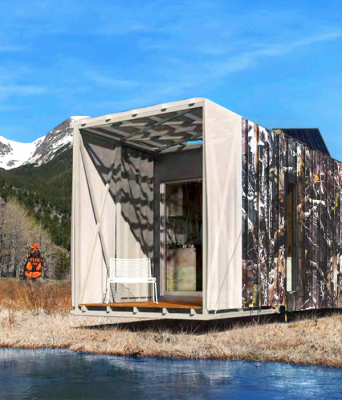 The Off-Grid micro unit has energy storage, small millwork bank, shower, fridge, toilet, sink, & dry good storage. 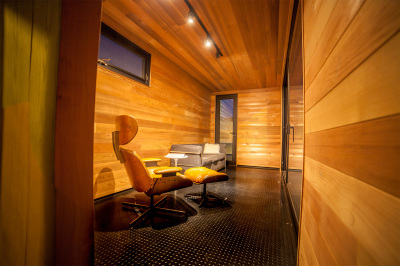 The Cave micro unit is spare, and serene. High quality lift & slide hardware operate the massive glass wall, with custom milled cedar clad walls & ceiling. Black rubber Pirelli floor tiles recall the trailer tires that move the unit as needed from location to location. All units are sprayed with a high quality aerospace-grade polyurethane paint over zinc rich primer, yielding a finish that is durable, weather resistant, & color fast. Like all commercial aircraft that are finished with the same surface paint treatment, the units are ready for rapid deployment. Daytime temperatures are hot, night time, cool. 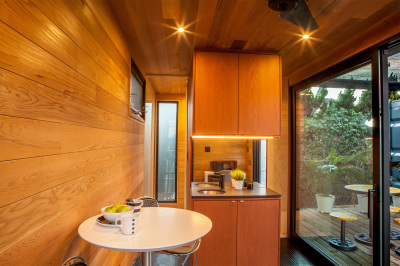 Our units are well ventilated, insulated, simply designed, with cedar clad interiors, an optional indoor/outdoor shower & sufficient battery storage to last multiple days. A backup 7kw propane generator will keep the unit running in the event of energy overuse or extra requirements.